Chris Dobson, CEO at The Exchange Lab, talks about how linear TV is trying to retain UK viewers, whose attentions are drifting across various platforms. 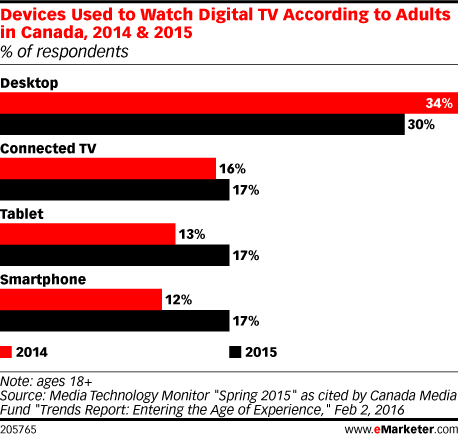 Internet users in Canada are becoming more connected, especially when it comes to video viewing, according to 2015 research. More than three-quarters of millennials in Canada have binge watched TV in the past year, according to research. The US digital video advertising market is on pace to nearly double by 2019. This growth will be led by an ongoing shift toward mobile viewing, a host of digital platforms that now prioritize video and a growing assortment of content against which to advertise. Mobile video ads can be effective and valuable for many marketers, and eMarketer estimates that video will also command a large portion of ad spending allocated to digital. Publishers and advertisers are becoming more comfortable selling and buying mobile video programmatically, per research. Demographics including age and gender play a significant role in digital video consumption in Japan, according to 2016 data. Men and internet users in their 30s are the most likely to view video—and a lot of it. Netflix has further expanded its reach globally, making the service available everywhere in the world except China. Original content, which has helped the company become a video streaming destination, is likely driving its streaming revenues—which far exceed its DVD revenues. Mobile messaging takes up a lot of smartphone time in China, where the average user has significantly increased time spent with their device in the past year. Online video viewing takes a distant second for smartphone time. The number of original scripted TV shows has grown over the years, not only on basic cable, but services like Hulu and Netflix, which have become video streaming destinations because of their original content. Video is taking over mobile data in the UK, according to 2015 data. The rise of 4G may be one reason, as eMarketer estimates two in five mobile phone users in the country will watch video this year. Debbie Weinstein, director of brand solutions and innovations for EMEA at Google, explains how YouTube has seen a jump in mobile viewers and time spent on these devices in the UK. 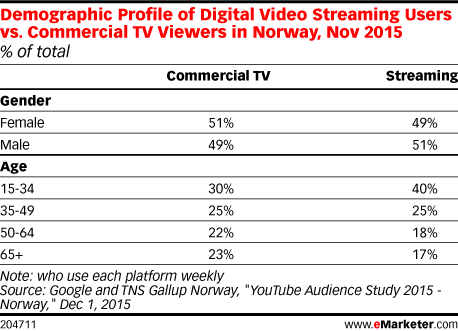 Both the commercial TV and streaming audiences in Norway are virtually evenly split between male and female TV viewers. Mexico has the largest market for over-the-top (OTT) video services in Latin America, according to 2016 estimates. But Brazil is set to outpace it in the next few years. Digital video viewing is popular in Brazil: Some seven in 10 TV viewers watch video via digital channels as well. And for the youngest among them, smartphones are the No. 1 viewing device. This will be a benchmark year for digital video usage, particularly streaming television. According to eMarketer’s latest forecast of digital video consumption, 2016 will be the first time more than half of the US population will watch TV shows online at least once a month. In 2016, 164.5 million Americans will watch digital TV—50.8% of the US population. That's a jump from 47.8% last year. The bulk of online video viewing time in Colombia is down to male viewers, according to 2015 data. Across all adult age groups, men spend substantially more time viewing video, in aggregate, than women. Mobile video advertising brings a lot of value to marketers, primarily increasing brand awareness. It also helps with lead generation and better engagement, according to a December 2015 survey. Internet users in Japan who are exposed to mobile video ad campaigns have better awareness, interest and purchase intent than those who aren’t—but it helps brand metrics even more when such ads are combined with TV commercials.